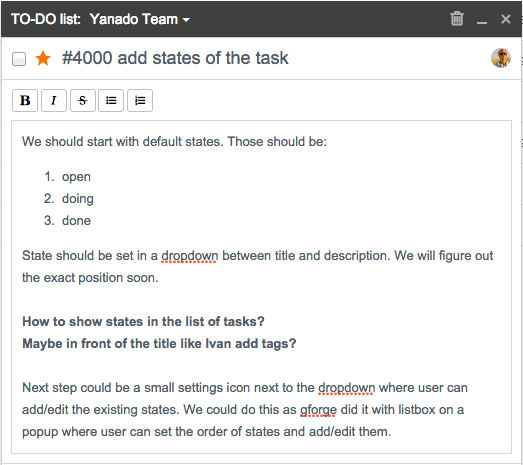 Since many of us have many Gmail accounts for various businesses, one of the top priorities for us was to implement a multiple account support system for Yanado. If you use more than one Gmail account, it can get a bit complicated for Yanado to assign & receive tasks from all of them. There were cases where certain emails, added from one Gmail account, users weren’t able to open in another. It started to get really annoying, so one day, we seat down and worked out a solution for this small, but annoying problem. It turned out, that all we need to do is change the authentication with Google, and redirect it from Oauth1 to Oauth2. 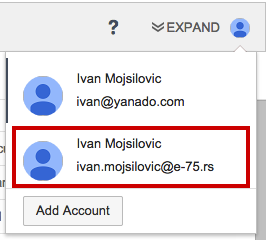 So now, if you want to add another Gmail account in Yanado, all you got to do is click on the user icon on the right hand side of your Yanado bar. 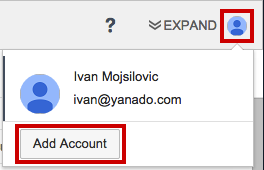 When you do that, the app will present you with an option to choose a specific Gmail account you want to add to Yanado. Once you selected and authenticated the desired account, it will become visible in the list of accounts on your Yanado bar. 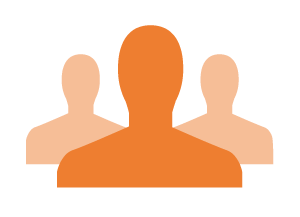 By selecting an account from that list you can jump from one Yanado account to another. Each account will have its own TODO lists and its own tasks. Many of you told us about the problems you were having with creating reminders in wrong calendars and polluting your regular events calendar. Some of you experienced awkward bugs, like creating reminders on your colleague’s calendar. In order to solve this issue, for each user, we’ve created a private yanado.com calendar where all their reminders are being saved. By doing this, we are disabling any possibility of seeing these annoying bugs again. As a next project ,we’re thinking about a settings option that will allow you to choose different calendars to assign to your Yanado. Until then, we hope that this new and improved version will suit your needs and serve you like it’s supposed to. To improve your productivity, we added several new features to the task details window. You can now add, mark text as bold, italic, strike through, as well as construct numbering and bulletins. Also, every link you put into description, Google shortener will automatically give it new coat and put it as a link inside description. Besides description updates, there are few more improvements on the task details window. Now you can easily move a task from one TODO list to another, just by selecting a list from a dropdown, like on the picture below. You can also delete a task by clicking on the trash container, up in the header. In the upcoming weeks, our primarily will be on improving user experience. Your help is really appreciated, so please continue to send us ideas, comments and overall impressions with your product. Seriously, we really value your feedback. Oh, did I mention that we are working on a team collaboration as well?